Eugene Burger (A Final Farewell), Posted on Youtube by Murphy's Magic. For more details please go to the 2017 Annual Archive page. This long and eagerly awaited hard bound edition containing all past issues has now been published (November 2013). Since the final quarterly edition was released in 2002, many people who had missed out on the subscription have been asking Mary Tomich, when would a compilation book be released? Well now it has and the wait has been well worth it. At 478 full size pages and about one and a half inches thick, this is a tome full of Bizarre and Storytelling Magic presentations and routines. 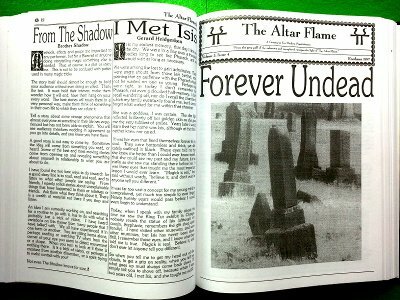 To read more about the past Altar Flame quarterly click HERE. The cost is only 85 dollars plus postage and packing. Only 300 copies have been printed and there will never be another printing and copies can only be ordered directly from Mary Tomich. To order directly from Mary's website click the link below. 2017,The 26th ICBM Gathering A.K.A The New England Gathering of the Magi. I am very sorry to be writing this letter, due to medical reasons I have to suspend the Gathering for this year. As some of you are aware I have been having some medical problems over the past few months and it has left me now unable to present this year’s convention. I am very sorry that it has come to this as I look forward to seeing you all and sharing our Magick, but for now I have to concentrate on my recovery. 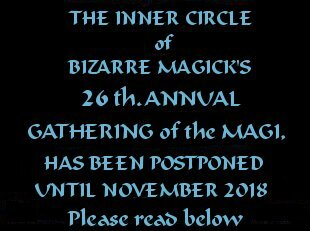 I look forward to seeing you all in November of 2018 for the I.C.B.M. Gathering breaking through the veil. To visit the Official ICBM website visit HERE . You can see reviews and clips of the event in past years in the 'Annual Archives'.